It is with deep sorrow that we must announce the passing of Dr Sylvia Meek, Malaria Consortium’s Global Technical Director, on 11th May 2016, after an 18-month battle with cancer. Sylvia’s contribution to the fight against infectious disease, and malaria in particular, through her own, and Malaria Consortium’s work, cannot be overstated. Originating from Hull in Northeast England, Sylvia had a passion for the environment and disease control that led her to study Zoology at Oxford and later Animal Parasitology at the University College of North Wales, Bangor, followed by a PhD in mosquito genetics and control at the London School of Hygiene & Tropical Medicine and Liverpool School of Tropical Medicine. Her research at the London School laid some of the early foundations for current work on what are now termed ‘Wolbachia-infected mosquitoes’. Sylvia’s work with the World Health Organization took her around the world, including periods in the Solomon Islands, Namibia and Cambodia – during which time she gained the nickname ‘Mosquito Sylvia’. She also worked with the World Food Programme and the United Nations Development Programme setting up and running disease control programmes for 200,000 refugees. Much of her work involved providing technical advice, especially on programme and strategy development. Most recently, Sylvia has been a highly-valued member of the WHO Malaria Policy Advisory Committee, where she helped drive some of the key policy changes related to malaria control and elimination. In 2003, Sylvia was one of those instrumental in transitioning Malaria Consortium from a collaborative Department for International Development resource centre to the evidence-based, health research and implementation charity we are today. She had a vision to reach the most vulnerable and bridge the gaps in health systems where they were weakest, whether those gaps were between research and implementation, facility and community, or public and private sectors, with interventions based on evidence and good science. Since the outset of Malaria Consortium, and before, Sylvia’s passion and commitment have touched and shaped many people in many countries, both directly and indirectly. Her contributions to the sector have been felt by partners and governments alike, and led to policy changes that have saved countless lives. We at Malaria Consortium are committed to carrying forward the legacy she has left us to touch the lives of those who need help the most. Sylvia, we will miss you greatly. 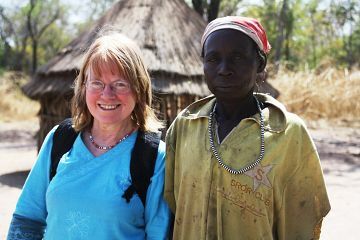 Photo: Dr Sylvia Meek meets with community drug distributors supported by our integrated community case management and nutrition project in South Sudan in 2012.